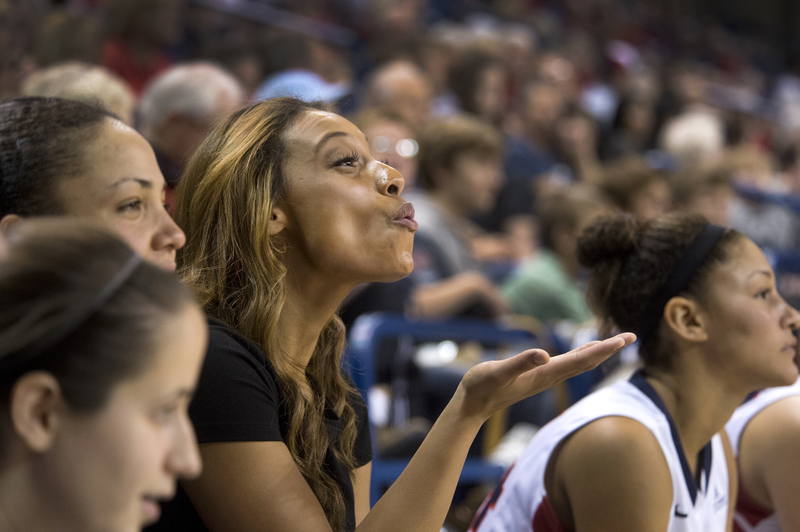 Fri., Jan. 17, 2014, 10:06 p.m.
Shaniqua “Shaq” Nilles has a little fan who watches her every move when the former West Valley star takes the home court for the Gonzaga Bulldogs. Not yet 2, Nevaeh peers out from the arms of her grandmother, Renee Nilles, whenever her mother, a reserve 6-foot sophomore forward, gets to play in a roster filled with talented players. After a recent win against then-No. 24 San Diego, Nilles had Nevaeh in her arms. She put the curly-haired toddler on the court and she immediately clomped over to senior guard Haiden Palmer. College athletes face a dizzying list of demands that include a full-time slate of classes, two lifting sessions, daily practices and often several days of travel, all in the same week. Nilles adds waking up early to change diapers to that already daunting list. She lives in an apartment and relies on day care and her parents, Jamie Nilles, a former coach and current athletic director at West Valley; and Renee, a former collegiate basketball player at Community Colleges of Spokane and Long Beach State who is the assistant basketball coach for the Mead girls. For Shaniqua, motherhood is just the latest challenge of a young life filled with activities. She noted after a recent practice that young fans who dream of someday taking the court in the McCarthey Athletic Center must first understand how much work it takes to get there. Palmer, who grew up in Moreno Valley, Calif., agreed. Gonzaga coach Kelly Graves said it takes more than just an athlete with talent to make it to Division I basketball. Jamie Nilles said he had several conversations about commitment with Shaniqua, who played soccer, volleyball and participated in gymnastics in addition to basketball. Shaniqua could have started for several college teams. Graves recruited her to play at Gonzaga and she accepted. That sparked a completely different conversation with her parents. Shaniqua said she doesn’t resent missing out on so many childhood activities for just a few minutes a game. In the heat of practice, fellow Zags rarely miss an opportunity for a little ribbing on Shaq. Despite playing infrequent minutes, Graves called on Nilles with only 3:23 remaining in the Dec. 8 road game against Ohio State. Jamie and Renee Nilles were watching the game on television in Spokane when Graves decided to put their daughter out on the floor. “Jamie was saying, ‘Are you kidding me? She’s been sitting for 30 minutes,” Renee Nilles said. With only 21 seconds to play, Nilles hit a layup to put Gonzaga ahead. But Ohio State retook the lead seconds later. Palmer then found Nilles open. She made a move and sank a 12-foot jumper at the buzzer for the victory. “Jamie said, “Wait, we have to see if it counts’,” Renee said. “I said: ‘We will drive to Ohio and beat those people if they don’t let it count.’ I really enjoyed afterwards watching all of her teammates embrace her. Renee Nilles noted that Shaniqua was on a basketball court as soon as she could walk. Just like Nevaeh. Asked how she expects to handle the same situation in a few years with her daughter, Shaniqua smiled. “I will tell her to just enjoy it, enjoy the chaos,” she said. “There will be some times, just like Haiden said, when you will not be able to go to the pool parties. Published: Jan. 17, 2014, 10:06 p.m.